Changdeokgung is one of the five grand palaces in South Korea. They are Gyeongbokgung, Changdeokgung, Deoksugung, Changgyunggung, and Gyeonghuigung. The five grand palaces were not built at the same time. Changdeokgung was built as the secondary palace next to Gyeongbokgung. The construction began by King Taejong, the Third King of the Joseon Dynasty, in 1405. Taking 7 years to complete, it was finished in the year 1412. In the word Changdeokgung, Changdeok means 'Prospering Virtue', and gung means 'palace'. So the word Changdeokgung means 'the palace of prospering virtue'. Because of the meaning of the name of the palace, the kings of Joseon Dynasty chose mostly Changdeokgung to live in. 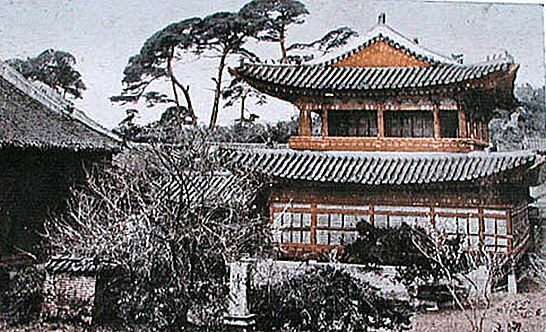 The palace had been the home of 14 kings of Joseon Dynasty until it was totally destroyed by the Japanese army in the year 1592. After the Japanese were driven back by the combined forces of Korea and China, Changdeokgung was rebuilt in 1612. 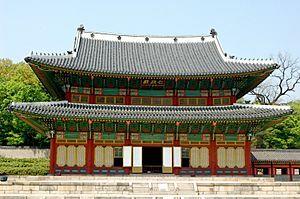 After the reconstruction, the palace had suffered little damage and became the primary royal court of the Joseon Dynasty. This was because Gyeongbokgung was also destroyed by the Japanese but the Joseon Dynasty did not rebuild it for some reason and the Changdeokgung became the biggest palace in Korea. However, Changdeokgung had suffered some damage for 350 years after the reconstruction. As a result, a large scale restoration took palace from 1990 to 1999. This restoration shows how much the Korean people loved Changdeokgung. Apparently, the UNESCO saw its value as well. Seeing Changdeokgung as a vital global asset, UNESCO listed it as a World Cultural Heritage. The UNESCO said that Changdukgung 'was outstanding example of Far Eastern palace architecture and garden design'. Changdeokgung is in a park in Seoul, the capital city of South Korea. There are total of 13 buildings remaining in all and the area is designated as Historical Site No. 122. Tourists from all around the world visit this historic site. Changdeokgung is also an enjoyable park for families to spend their weekends. Gyeonghungak was an attached two-storied building of Daejojeon Hall of Changdeok Palace. The first story was Gyeonghungak. and the second story was Jinggwangru. Changdeokgung Facts for Kids. Kiddle Encyclopedia.